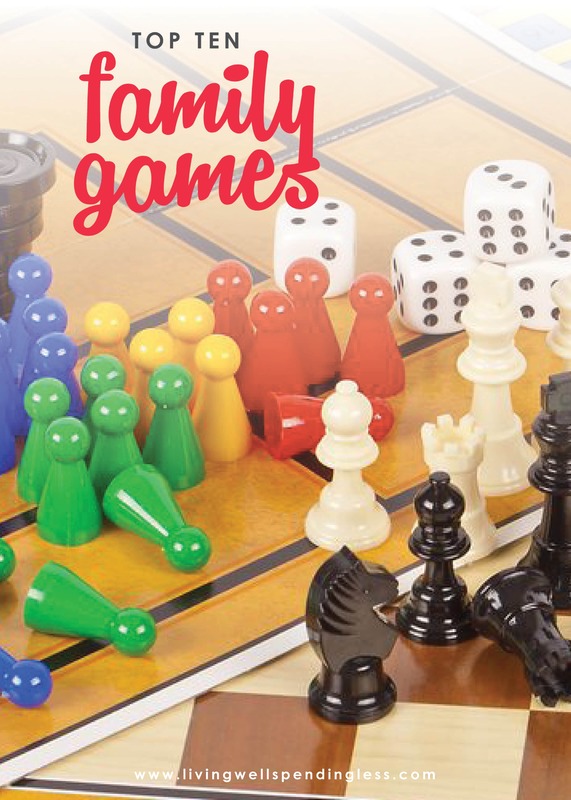 In a world of constant technology and near-continual screen time, sitting down together as a family to play a few rounds of our latest favorite game is our favorite way to unwind. Unlike video games, board and card games offer face-to-face human interaction. Plus, they really allow you to stretch your brain. They’re fun, creative and intellectually stimulating. We aren’t a hugely competitive family, but my girls enjoy giggling over who wins or who misses a turn. Games foster teamwork and individual growth. They help build skills like counting, literacy, logic and more. Not only that, but they also increase family togetherness and bonding. Whether we have a full day of games or just an hour or two to play, our family always finds ways to make the experience special and exciting. First of all, having some snacks on hand can be great, but aim for items that aren’t sticky or greasy so you don’t mark up your cards or spill on the boards. While playing, we usually stick with water to drink and munchies like pretzels, grapes, almonds or plain cereal—all foods that keep your hands clean and don’t require much maintenance to eat. 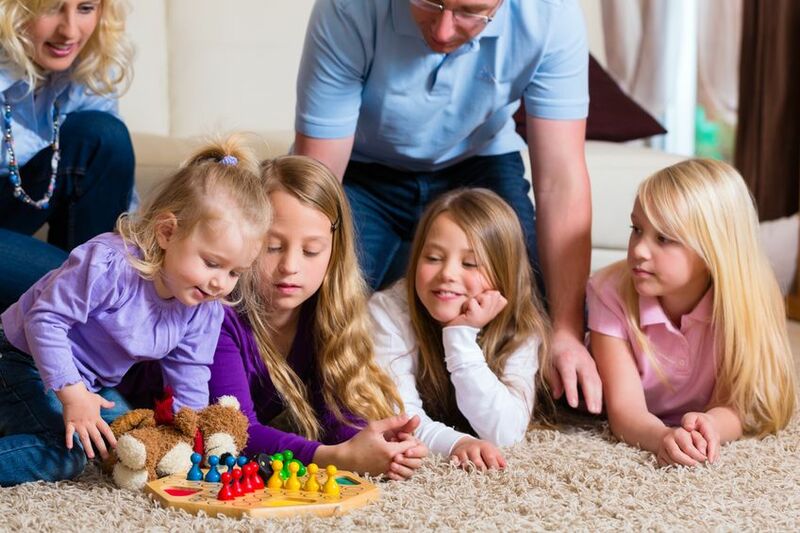 Playing games on the table can be great, but consider spreading things out on a rug on the floor or setting up various stations and rotating games throughout the house. For a group of friends, oversized game pieces, dice, or giant Jenga can be a great outside adventure. You can even spray paint Twister spots on the grass and play outdoor rounds. Many board games travel well to a beach or picnic and some even work great in the car. If you’re concerned about little pieces getting lost, card games are a great option. We’ve found that taking a few games on our road trips gives our kids some much needed quiet and downtime, and helps us find something to do if there’s a wait due to weather or a pool-free hotel. A few years ago, I worked on a list of our family’s top ten board games. These were the best games we found for our kids (ages 4 and 6) at the time. We chose games we played at home, with friends, and simply just as a family. These games had to be easy to play, interactive and fun. Bonus points for games that could be played on their own without help from mom and dad! Since it’s been a few years and our kids are a little older, their interests and abilities have grown and changed. There are some games from our old list they still love, like Spot it! and I Spy Go Fish. However, they’ve simply outgrown some of the games. Candy Land, for example, has lost a little luster, especially with my older daughter. Plus, now they enjoy navigating a few harder games that require reading, math and logic skills. Blink: Hailed as the “World’s Fastest Game,” this two-player card game is all about matching patterns by shape, color or number. Blink is highly portable and can be played by a pretty wide range of ages and abilities. It’s inexpensive and simple, but really great! This quick game of hand-eye coordination helps boost your child’s ability to recognize patterns. It also causes some serious giggle fits and it’s highly addicting! In fact, mom and dad have been known to play this game just for our own entertainment. Reverse Charades: In traditional Charades, one person acts out a word or phrase while someone else guesses. In this hilarious version, everyone acts out the phrase while one person is the guesser. Somehow, when everyone in the group is acting it out at the same time, the game becomes that much more funny and interactive. This is one of our top party games and go-to games for a crowd. It’s easy enough to understand (most people have played some version of Charades at some point) and it is seriously hilarious. This game is for six or more players, ages 6 and up, so it’s definitely a group or party game. 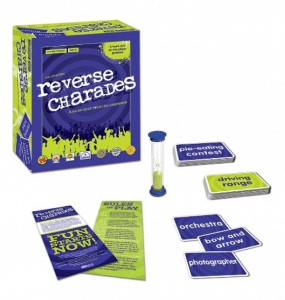 Reverse Charades is a great team-builder and it helps kids learn to work together and communicate in different ways. It’s certainly not a “quiet time” game, but if you’re looking for a wild time for everyone, this game is IT. Independent Play? Not unless there’s a large group. 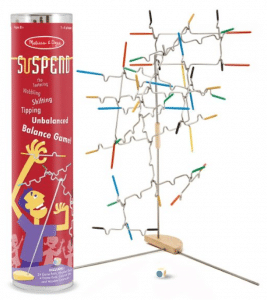 Suspend: This game requires a steady hand and the utmost concentration. If you have any engineers or builders in your household, they’ll love Suspend! While it’s similar to Jenga, the nice thing about this game is you can play it on a table without fear of denting your furniture or waking the neighbors with a loud crash. Not only that, but Suspend is great for developing hand-eye coordination and cognitive reasoning skills as you attempt to carefully balance each rod on the growing, teeter-tottering structure. One of the best parts of this game? It’s almost as much fun to play alone as it is to play as a team! It’s recommended for ages 8 and up, but a 6 or 7-year-old can catch on pretty easily if they have a steady hand. 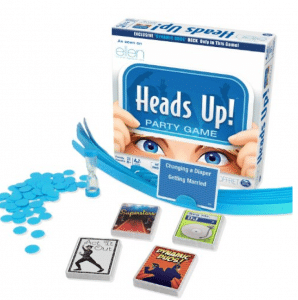 Head’s Up: This game was a popular app that originally appeared on the Ellen DeGeneres Show. To play, you put on a headband loaded with cards. Then, the other players act out, hum or mime each phrase, celebrity or song they see, without using words. The results are absolutely hysterical! This game works best in groups of 4-6 but can be played with just two players. It’s targeted for ages 8 and up, which seems to be appropriate, as younger kids struggle with some of the references. 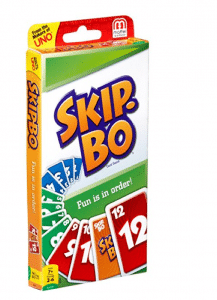 Skip-Bo: We just love this classic card game! 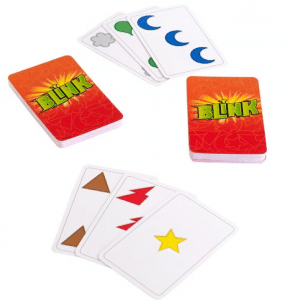 Skip-Bo is a card-sequencing game that helps kids learn about counting and strategy. Given a series of numbers, players build piles of ascending cards. Wildcards are also thrown in to mix things up. This game is targeted to ages 7 and up and can be played with 2-6 players. This is one of our go-to travel games, as it’s small enough to throw in your bag, car, or backpack and take along. 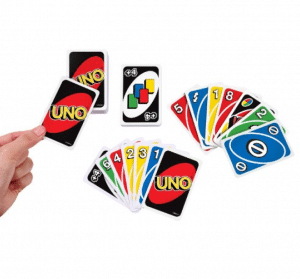 Uno: Similar to Skip-Bo, Uno is played by sequencing numbers and colors, using red, blue, green and yellow cards numbered 0-9, plus wildcards to add to the fun and strategy. Uno is fast-paced and fun because there’s always the opportunity to hijack a win by using action cards. At the last minute, an action card forcing a player to reverse direction, skip a turn, or even swap cards with another player keeps everyone on their toes. Customizable wildcards add even more to the family fun. Uno is a classic, and can be played with 2-10 players, ages 7 and up. (Although some savvy 5 and 6-year-olds can catch on, too.) It’s a lot of fun, it travels and packs well, and it’s simple and interactive. Everyone will be racing to get to yell “Uno”! 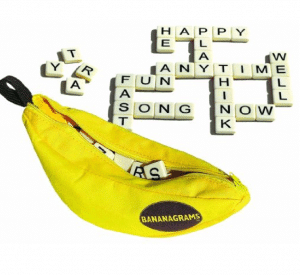 Bananagrams: Bananagrams is similar to Scrabble, minus the board, pencil and paper. Essentially, you build crosswords using small lettered tiles. This game travels easily, helps young readers and spellers learn literacy skills, and is totally addictive and engaging. We love this game because it’s easy to play anywhere and can be played with 1-8 players. It’s appropriate for any child who can read (ages 7 and up), and it really helps reinforce language and vocabulary skills—yet your kids won’t even know they’re learning! Plus, it comes in a cute banana pouch that zips up and goes right along with you! Independent Play? Yes, depending on reading skill level. 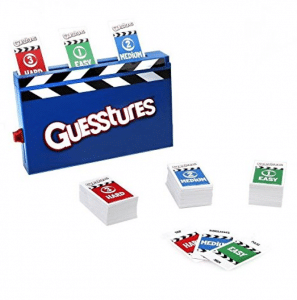 Guesstures: Looking for a game that’s fast, frantic and fun? You got it! To play Guesstures, place four cards into the timer, then use charades and gestures to get your team to guess what you’re acting out before the card disappears! This is a great game for four or more players (it’s a wonderful party game) and it’s appropriate for ages 8 and up. This game seems to evoke everyone’s goofy/silly side. Your whole family will be in stitches as you try to guess what on earth your team members are doing! Independent Play? No, this is more of a party game. Catan Junior: The award-winning Settlers of Catan is hailed as one of the greatest board games ever—so if you’ve enjoyed the original, the Junior version won’t disappoint. It’s a highly engaging interactive experience, as you build a village, trade resources, and try to capture seven pirate hideouts as you work toward creating an island. 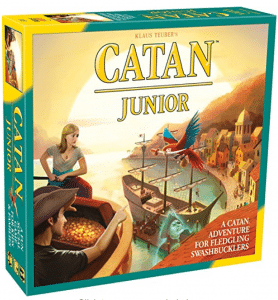 The original game is for ages 10+, but Catan Junior offers a similar experience for kids as young as 5 years old. While it’s quite involved, it’s one of those games where you become so into playing you hardly notice how much time has passed! This game is for 2-4 players. Independent Play? Once your kids learn the rules they can play without assistance. 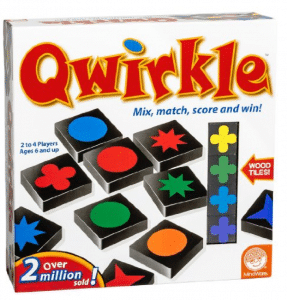 Qwirkle: Qwirkle is like a combination of Scrabble, Blink and other matching games. 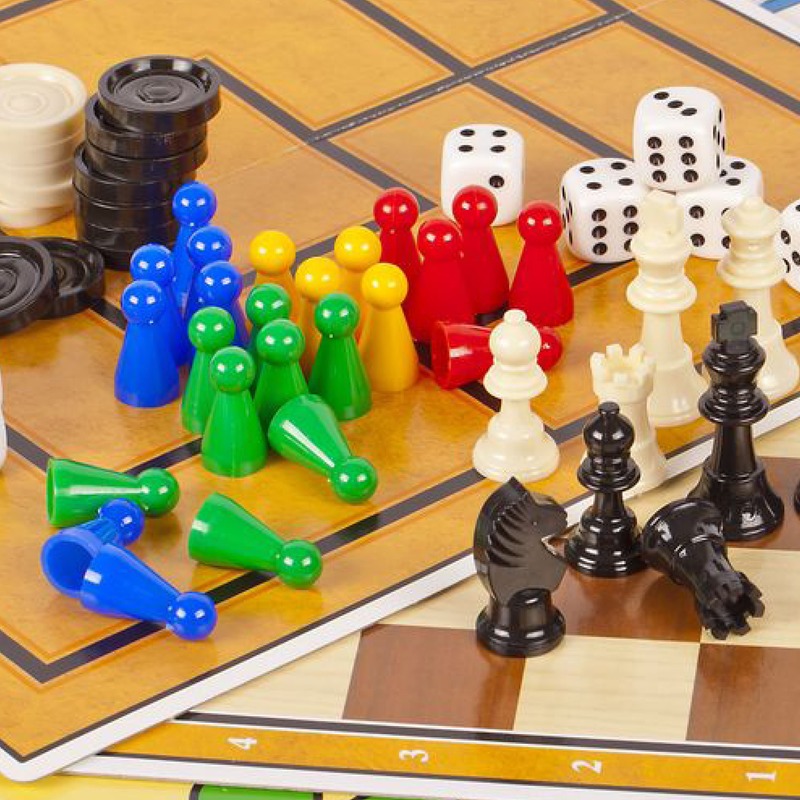 You build chains of color-coded symbols to create different patterns and strategize to maximize points. This game builds on logic skills, deduction and reasoning. It was the winner of the Parents’ Choice Foundation Gold Award, as well as the Mensa Select National Competition Winner. That said, it’s quite simple to learn and involved enough to hold kids’ interest for long gameplay. It’s for 2-4 players, ages 6 and up. Strategy keeps growing as players learn the ropes through play. Games bring families together in a way so many other activities can’t. They give us opportunities to laugh and be silly together, to learn together, and to grow together, both independently and as a family. 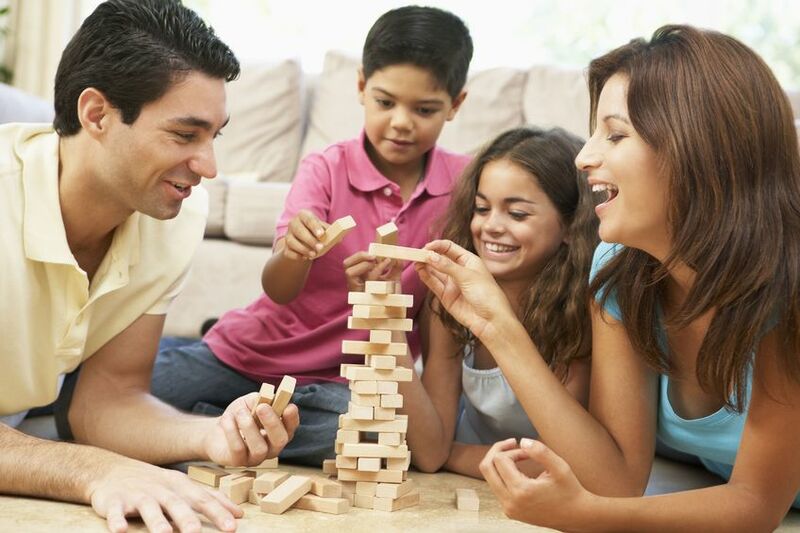 Family game night will always be a part of the way our family has fun! I’d love to hear your list of family-favorite games! What does your family just LOVE to play? Did your favorites make our list or are there others you recommend? Let us know your favorite games and why your family loves them so much! Thanks for this post! My 7 year old and I were just talking about games the other day. We also like playing Bounce Off where you try to bounce ping pong balls into a tray and make a shape. Or the Disney Eye Spy game is great for older and younger siblings because you are trying to find characters on a large floor puzzle before the clock strikes midnight. Thanks again for this post. We’ve been wanting to try Catan. Perfect Christmas present. Apples to Apples is a great choice, too. One of our favorite things in the winter is to be working on a jigsaw puzzle together. It is something we can all work on at the same time or a few minutes alone here and there. As the kids get older we have increased the difficulty of the project. One of my sons has carried on this tradition with his college roommates when they moved into a house. We also love Apples to Apples Junior, Sushi Go, Spot It!, Monopoly (kids more than adults, haha), and Ticket to Ride. Sushi Go and Spot It! are small and portable, and good for traveling. I carry Spot it! in my purse. We will pull it out at restaurants while we are waiting for food. Makes long waits seem short for the kids. My daughter was 4 when we started this and she is 6 now and requests it during long waits. My son is 9 and will join in the game too. Survive: Escape from Atlantis, Labyrinth and Ubongo are all hits in our house. Playing a game together is our favorite family activity, especially in the winter! Mad Libs are fun for the car, subway, or waiting rooms. There’s a secret grammar lesson for the kids while you make up hilarious stories together! My daughter and I loved to play Rat-a-tat-cat when she was younger. Have you ever considered outside games? There’s some good game choices here, especially Qwirkle. One noticeably missing is called ICE COOL that’s very hands on.